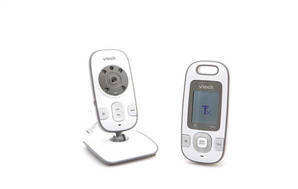 Snapshot: The Vtech Safe & Sound BM2600 is a baby monitor with plenty of features. But how well does it perform? Baby unit cannot run on batteries (couldn't use it outdoors). Camera has narrow viewing angle. Sound volume at carer unit may not be loud enough especially in a noisy room. "Poor sound & video quality"
21 Aug 2018, Louise M.
It's easy to set up, has rechargable batteries (just plug in), and the receiver has an easy clip to take it around with you. It also lets you zoom in to the image. The max noise level is quite quiet, if there was a tv or music playing you would likely miss your babies cries.